With the winter setting in and the skin peeling off and getting flaky, exfoliation becomes necessary to get rid of dead cells and also to provide the skin much needed moisture. 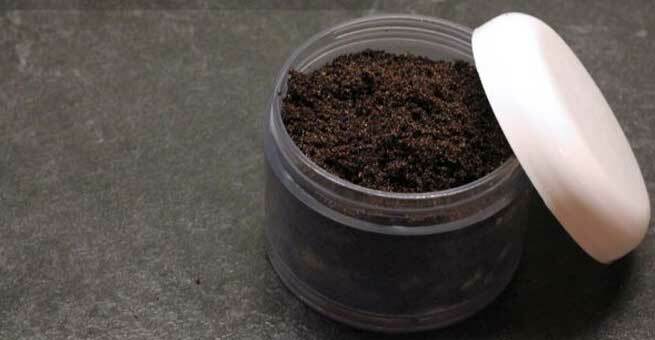 Exfoliation using coffee grounds is a great way to rejuvenate dull skin. You don’t need to visit a parlour to get the expensive coffee scrub or wrap done to get great skin. Making a coffee body scrub is simple and you can do it at your comfort at home, at almost no extra expense! Try and use brown sugar rather than the more processed white sugar if possible. Mix the ingredients together. Store this in a bottle for use when necessary. However, if using brown sugar, then remember that the mixture will not last longer than a month since it is moister than white sugar. Whenever you feel like a body scrub, take the required quantity of the coffee and sugar mixture in a bowl. To this, add olive oil and honey in 1:1 ratio. Start by adding a spoonful of each and continue adding until the ingredients form a smooth paste.You can also add some lemon juice or grated ginger to it for a fresh aroma. Adding ground cinnamon to the mix will take your scrub to another level altogether! Get into the shower and apply this scrub on damp skin using your fingers. Scrub it well on the skin in circular motion with either your fingers or a sponge. Focus on areas with very dry skin. Rub into skin until the sugar starts dissolving. If you want extra benefit from the skin, you can wrap a warm towel around your body for ten minutes after scrubbing. But if you are worried about the coffee staining the towel, you can skip the wrap and simply let the scrub rest on your skin for ten min. After ten minutes, wash off the scrub. Rub down your body with a loofah and some mild body wash. Shower yourself with lukewarm to warm water. Very hot water will again strip the oils from your skin. Tap your skin dry with a towel. Repeat this every week. The fragrance of the coffee and sugar mixture will have a calming effect on the mind. Coffee is known to have fat combating enzymes. Doing a coffee body scrub regularly is known to fight cellulite. So while scrubbing, focus on areas with cellulite and stretch marks. Prolonged use will reduce the fat deposited under the skin. The olive oil will nourish your skin and the honey will help retain moisture and also lighten the skin tone. Ensure that if you are using this scrub on the face, avoid the area around the eyes. The skin around the eyes is very sensitive and the granules in the scrub can damage it. So the next time you feel like pampering your body, try this homemade coffee scrub that will get your skin glowing.